This PDF 1.5 document has been generated by Microsoft® Office Publisher 2007, and has been sent on pdf-archive.com on 18/12/2011 at 06:01, from IP address 173.140.x.x. The current document download page has been viewed 731 times. yes, the grass to mow. banners have been installed along 135th St.
created a swamp complete with six-foot reeds. Call Mark at (816)898-8444 for market hours of operation, leasing information. 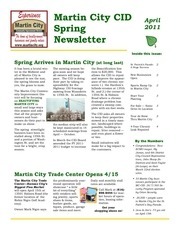 in Martin City for the St.
on Sunday — March 13, 2011.
support you any way we can. City is the place to be. verted to a real estate office. For more information on the property call Carol at (913) 731- 4490.
speed on north across 133rd St.
and cultural activity as well as special events . a.m. Hardees's (Martin City) breakfast is served. as possible to keep up to date on the District goals, activities, achievements and to give your input. began the work finishing on St.
of everyone. Check it out. when it became a skating rink. entered Jess &amp; Jim’s Steakhouse. to properly correct this problem. the funding for a permanent solution. This file has been shared by a user of PDF Archive. Document ID: 00035859.